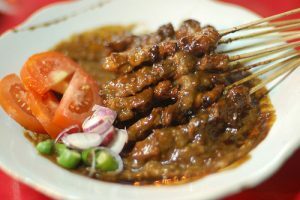 Satay or Sate, for many Indonesian people, the word is the first thing that comes to mind when they were asked about the typical culinary in Madura. Sate Madura is indeed very famous and legendary. Almost in various regions in Indonesia, Madura satay sellers can be found with their distinctive style, namely red and white camouflage shirts and udeng headgear. As mentioned before, sate is clearly the most famous Madura culinary. Sate Madura is made from chicken meat. 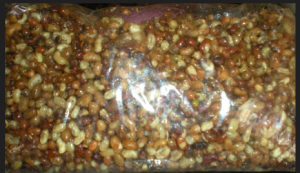 Its distinctive feature is the legumes that are legit and very flavorful. Another typical Madurese cuisine that is no less famous as satay is Soto Madura (Madura Soup). We can also find sellers of Soto Madura in various regions in Indonesia. 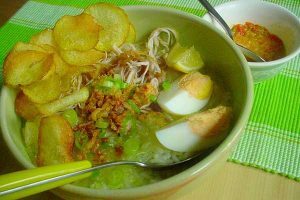 Soto Madura has several different details with other soto (soup), which are slightly concentrated and savory gravy and served with sliced ​​boiled eggs and crispy fried potatoes like chips. Madura cuisine is indeed inseparable from ducks. Bebek Songkem is a processed Madurese duck originating from the Sampang area. It has flavorful taste and rich whit spices. 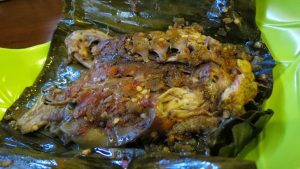 Lorjuk is usually processed as a sauteed or spicy rica-rica dish complemented with rice. The most famous Lorjuk is Lorjuk chips. This Lorjuk chips has a savory and crunchy taste so that they are used as souvenirs for Madura. Otok is very fitting to be eaten as a snack to accompany your trip or as a gift for relatives and friends. Otok can be found easily in souvenir shops in Madura. The price is relatively cheap and also the taste that is salty, savory and crispy is very popular with tourists as a souvenir choice that is right for families at home. Topak Ladeh is a coconut milk soup similar to Opor (Javanese coconut milk soup with chicken), but the difference is that this dish is seasoned spicy and the sauce is thick red with beef filling and rice cake. The use of some additional spices and red chili makes the taste of this dish so strong and delicious. 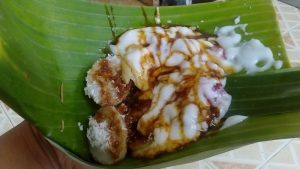 This food is made from a mixture of sticky rice flour and flour, then poured with brown sugar liquid and served on banana leaves. It tastes sweet and is typical of sweet porridge. Many of these cuisines are sold in a basket. Although this menu is fairly simple, Madurese are very fond of eating this menu as a dessert after eating heavy fatty dishes. 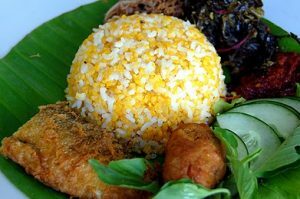 Nasi Serpang is one of the typical Madurese culinary menus whose presentation is similar to mixed rice which we often find elsewhere. 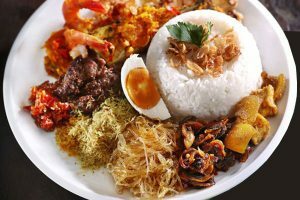 Madurese rice dishes are typically ranging from sliced ​​chicken or beef, boiled eggs or shredded eggs, oseng-oseng bihun, sauteed beans, fried potato sauce and krecek, fried tempeh, stir-fried tofu and so on. 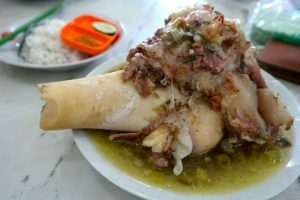 The dish a typical Madurese menu which contains green beans cooked with meat broth and cow’s tongue or beef marrow along with the bones. The appearance of the staple broth will immediately increase appetite because the aroma is savory and the appearance of beef bone marrow is unique. Madura corn rice has the characteristic of a mixture of rice and corn cooked fluffily. Served with various kind of side dishes and vegetables. It taste very tasty, spicy and filling. 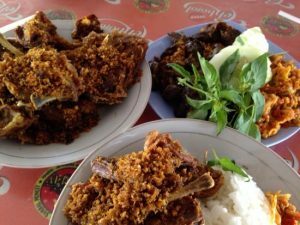 This one duck culinary is on the rise and many are targeted by tourists from outside the city, even many customers from the nearby cities of Madura such as Surabaya and Lamongan are willing to cross the Suramadu Bridge just to taste the delights of this duck. Satan rice, as the name implies, does have a hot and spicy flavor. 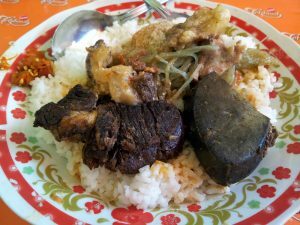 This typical Madurese cuisine can be found especially in the Bangkalan area. The presentation of devil rice is so complete and varied. 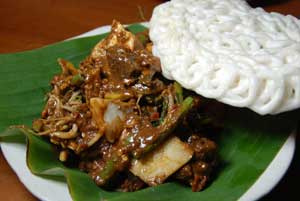 Visitors can enjoy a serving of this dish with beef slice as side dishes, vegetables, and spicy Madura chili sauce. The filling material is almost the same as other cingur salad ingredients such as cingur (mouth) beef, lontong, young mango, cucumber, kedondong, bengkoang, sprouts, boiled kale, tofu, temped and crackers. What distinguishes it is the taste of Madur cingur salad is more savory and the beans are even brighter. 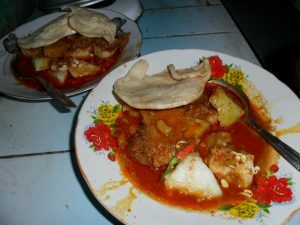 This dish is unique and it is hard to find in other regions besides Madura and nearby cities. Campor is a menu that contains a variety of ingredients such as boiled cassava which is cut into small pieces, rice cake, the young bone of a cow that is still smoked, noodles soon, and leeks that are washed with a sauce made from liquid coconut milk and peanut sauce. This sweet dish is made from a mixture of rice flour and salt that is simple but has a distinctive taste that is savory, legit and slightly sticky on the tongue. 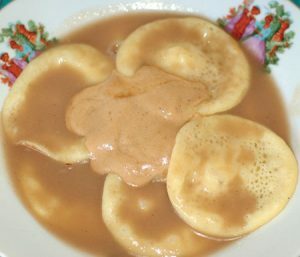 Apem manis is generally served with gravy made from brown sugar or can be served only with a sprinkling of brown sugar. This dessert is very fitting to be eaten in the morning with a cup of coffee or at night to wash mouth after eating various spicy heavy dishes. 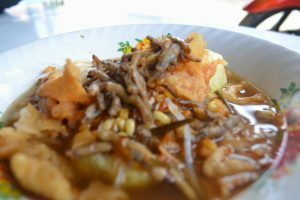 Those are the typical culinary menus that you can try when you visit Madura. Everything is delicious and has its own uniqueness which is a pity if you miss it. Enjoy your culinary tour in Madura.